There are books that you buy, books that are gifted to you, books borrowed from the library and books passed on through generations. Then there are books that mysteriously appear in your life. 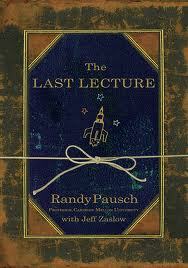 "The Last Lecture" by Randy Pausch was one such book that appeared in my bookshelf. I was dusting the books one morning and I found this "The No.1 Bestseller" on the second shelf. I have no memory of buying it or receiving it (or stealing it!). So I figured that it was in my hands for a reason - for me to read it NOW. Normally authors write books and then go on a promotional tour. In this case, the author, Randy Pausch, a professor at Carnegie Mellon University, gave his "Last Lecture" at the University. It was a fun and poignant lecture since Pausch had been told he had only 3-6 months to live after detection of pancreatic cancer. He was 47 years old. The lecture became a huge hit with millions of viewers seeing it on the internet which then became a reason to put his inspiring words into a book with the help of Jeffrey Zaslow. The book is now a major bestseller and continues to influence people 3 years after the death of the author. The book begins with Pausch making an unlikely statement "I won the parent lottery" referring to his good luck at being born to parents who brought him up with the right values and support to help him move ahead in life while keeping him firmly grounded. The speech was about achieving your childhood dreams. For Pausch it included experiencing zero gravity, playing football and being a Disney imagineer among others. In a self-deprecating humorous narration, Pausch tells us the stories of how achieved (or did not achieve) all the dreams but shares the lessons he learned while pursuing them. He tells stories of his teachers, mentors and students who he has enabled to achieve their own dreams. In a non-preachy manner we get nuggets of wisdom which were either passed on him, or are cliches that work or gems that he has gleaned from his experiences. All the humor comes with an underlying tone of sadness but at no point do we feel "you poor thing" for Pausch. All that comes through is his earnest wish to pass on a part of what he feels are lessons for his 3 young children who will not have a father as they grow up, to the larger audience that he is ostensibly addressing in his last speech. So the speech is really about "how to live your life". I went on to watch the Youtube speech after finishing the book and it is easy to see why the speech has been so phenomenally successful. Pausch is handsome, persuasive and completely in control. The amazing optimism and sense of awe and gratitude for his life is clearly evident in his narration as well as the tremendous passion for life and family. Should you read "The Last Lecture"? Absolutely yes. If you are not a reader, watch the video.